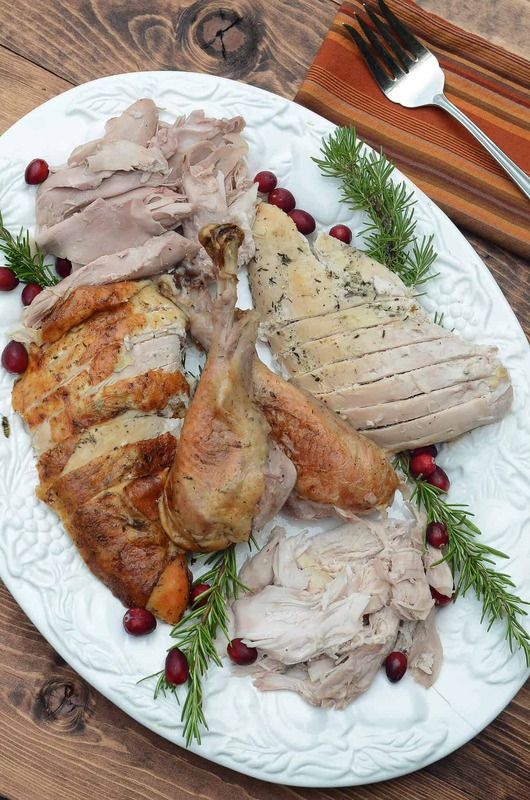 A wonderful, buttery, herb seasoning rub helps to create this tender, juicy Herb Roasted Turkey. The perfect centerpiece for your holiday table! 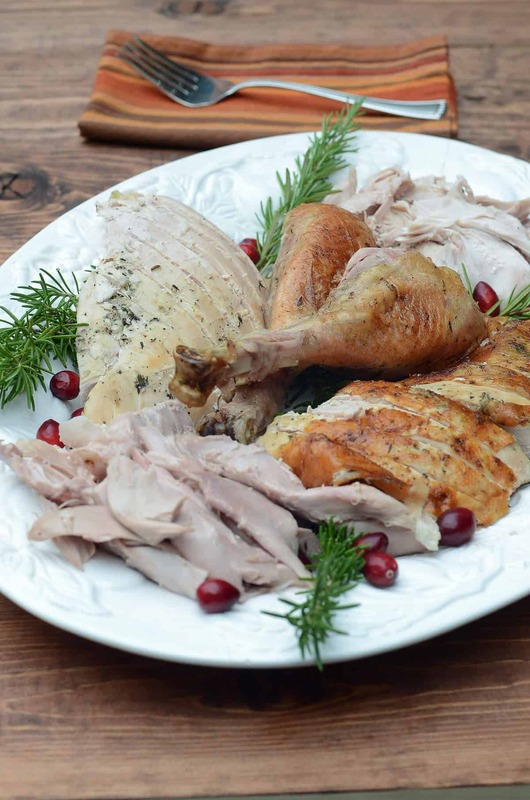 It’s that time of year, turkey time, and I’m here to share my favorite method and recipe for a dependably juicy and flavorful Herb Roasted Turkey. Let’s remove the fear, it’s not that hard, and the result is so worth the trouble. I’m going through it, step-by-step, from prep to table. 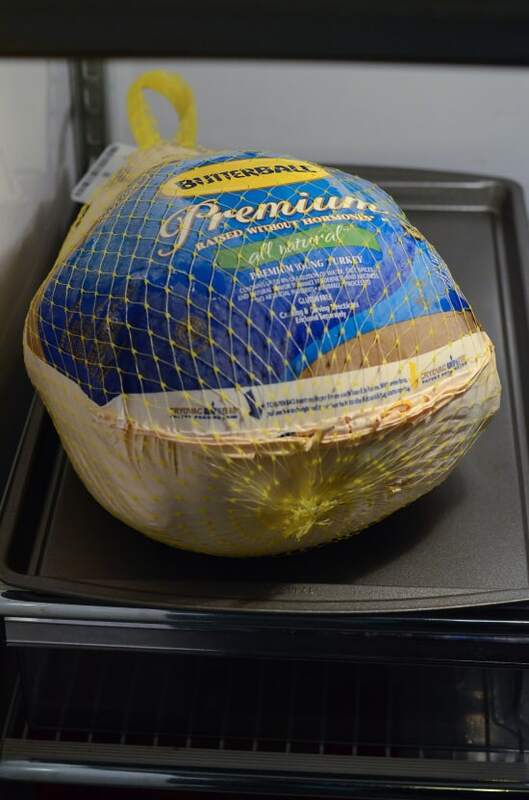 Here is my 14 pound frozen Butterball turkey thawing on a rimmed baking sheet in my fridge. It took about 3-1/2 days for it to thaw completely. I started the thawing process 4 days before I planned to roast the turkey just to be sure it would be completely thawed. If you have space next to your sink this is an ideal spot to work on the bird. 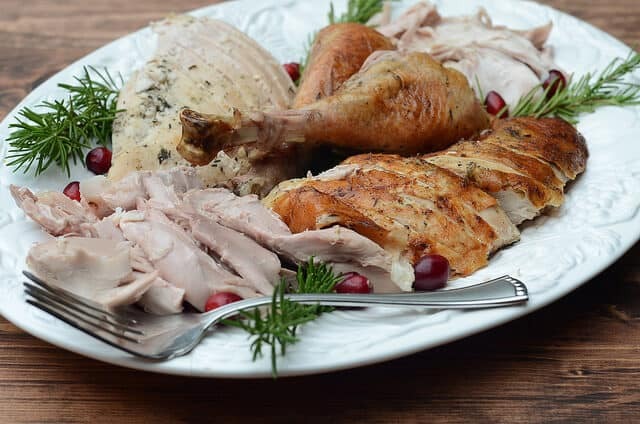 To keep things sanitary, remove the turkey from it’s packaging and transfer it to a foil lined baking sheet or cutting board. When you’re done, you can toss the foil for easier clean-up. Turn the bird around and reach into the smaller cavity. One of the reasons I love Butterball is the way they package up the organs in a nice pouch for you. Some folks save these goodies to make giblet gravy. Mine are being tossed. I have no need for this mile long stretch of turkey skin. I like to trim this down with a sharp knife, leaving only about an inch or so of overhang. The skin will shrink during roasting and we want all of the meat covered. There is a stronger chance of contamination in your kitchen if you wash the bird so the newest recommendations are that you skip the bird bath and just pat it dry with some paper towels. Easy. Time to mix up the wonderful, buttery, herb seasoning rub. It consists of butter, olive oil, garlic powder, thyme, sage, salt, and fresh ground pepper. 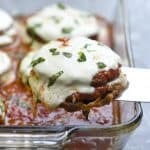 I’ve done this with both fresh and dry herbs and actually prefer the dry herbs for this purpose. If you have fresh herbs on hand, by all means use them but I wouldn’t pay extra for fresh. Carefully lift the skin of the breast and push your hand inside, as far as it will go, being careful not to tear the skin. Scoop up some of that butter mixture and spread it under the skin on both sides of the breast meat. Really get it up in there and give that turkey a massage. Spread most of the remaining butter mixture all over the outside of the turkey, reserving a little for later. Stuff the big front cavity of the bird with a quartered onion and a chopped carrot. 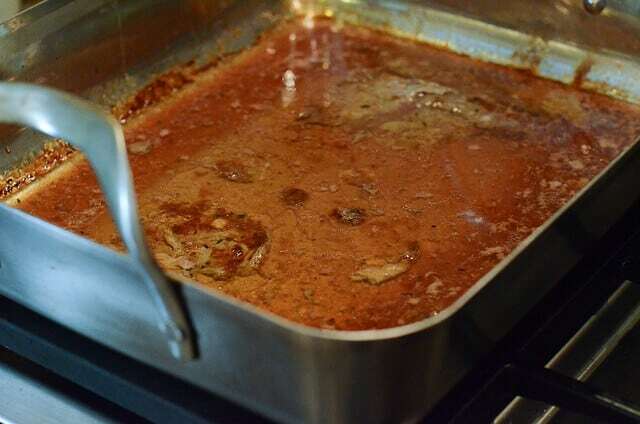 These items help add flavor to the turkey drippings and flavorful drippings equal yummy gravy. 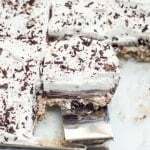 Feel free to substitute anything to your liking, fresh sprigs of rosemary or other fresh herbs are nice if you’ve got them on hand, and some like to add apples or lemon. 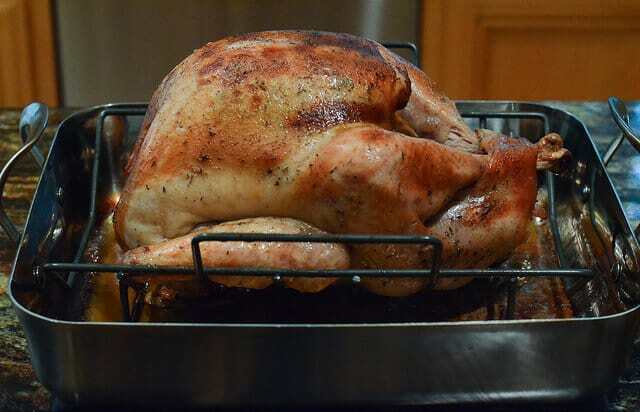 Transfer the prepared bird to a sturdy rack inside a large roasting pan. The rack is essential and worth buying if you don’t already have one. 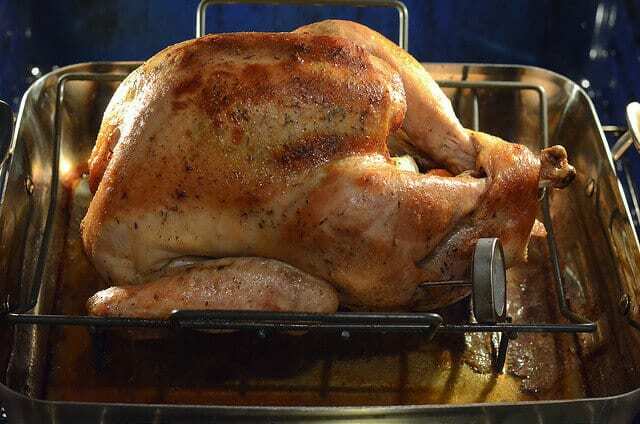 The bird should be elevated in order for the heat and air to circulate around it as it roasts. Spread the remaining butter mixture over the bird after you’ve transferred it to the roasting pan. Tucking the wings under the bird is mainly for a pretty presentation once it’s roasted. It’s an easy step, so let’s do it. Pull the wing back and push it under the bird to secure it. Here is our neat turkey with the wings tucked underneath. Turkey yoga. Namaste. Pour about 2 cups of chicken broth into the bottom of the roasting pan. I love these resealable cartons from Swanson. You can just pop the remainder in the fridge for later. Place the roasting pan in a preheated 325 degree oven and go do something else for an hour. 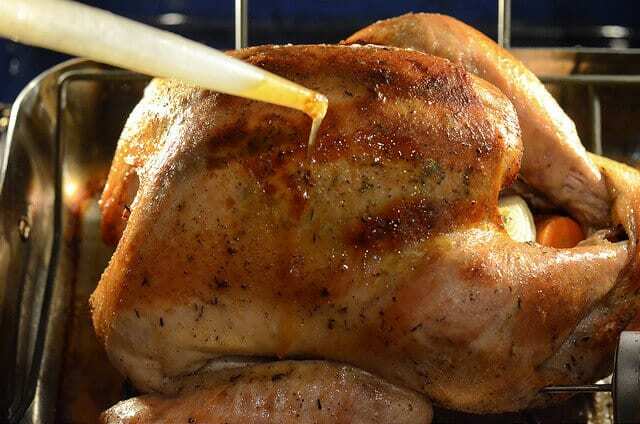 Come back to baste the bird with the pan drippings after the first hour of roasting. After it’s been in the oven for a couple of hours it’s time to insert the meat thermometer in the meatiest portion of the thigh. The thermometer you see above is the type you can leave in the oven. If you are using an instant read thermometer, there is no need to check the temp at this point. It’s also a good idea to rotate the pan for more even roasting. There are varying opinions on basting but I am a baster. After the first hour of cooking time, once very 30 minutes or so is plenty. Add more chicken broth to the pan if needed. 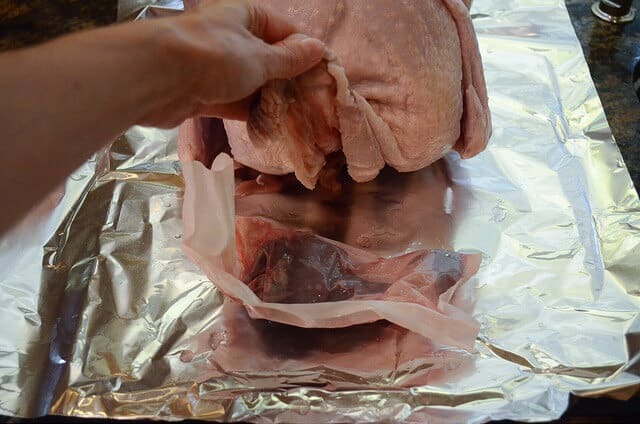 Once the bird is browned to your liking, grab a piece of foil and cover the bird loosely to prevent further browning for the remainder of the roasting time. When the temperature on the meat thermometer reads a solid 165 degrees, it’s time to remove the turkey from the oven. Tent it loosely with foil to retain the heat. The turkey should rest for 30 minutes before carving. Don’t be tempted to rush this. 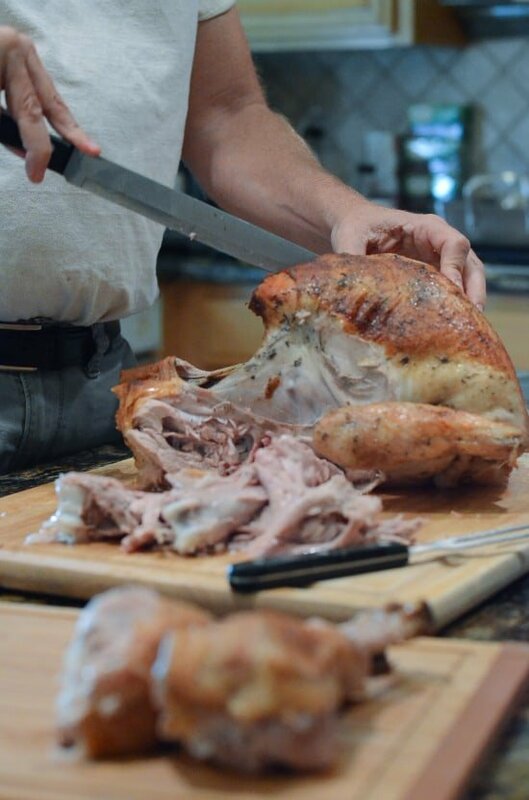 Resting helps the turkey retain it’s juices and makes it easier to carve. 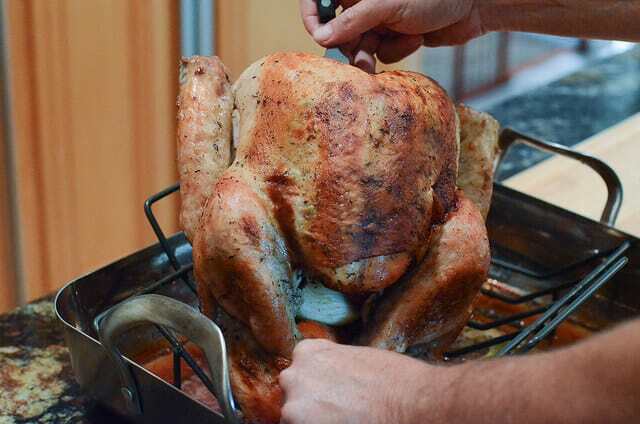 When you’re ready to carve the bird, tilt it up to allow the juices to run from the cavity into the roasting pan. If you don’t do this, you’ll have a mess on your kitchen counter. 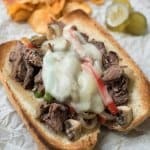 Don’t toss those rich, flavorful drippings. We’ll be needing those for the gravy. 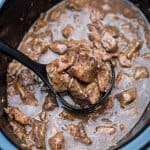 Be sure to check out my recipe for Easy Turkey Gravy. Grab a man, any man, or woman, who is willing and able to carve the turkey. I like to leave the skin on one portion of breast meat and remove it from the other to please everyone. You can see that even after the skin is removed, those wonderful herbs we massaged under the skin are present. 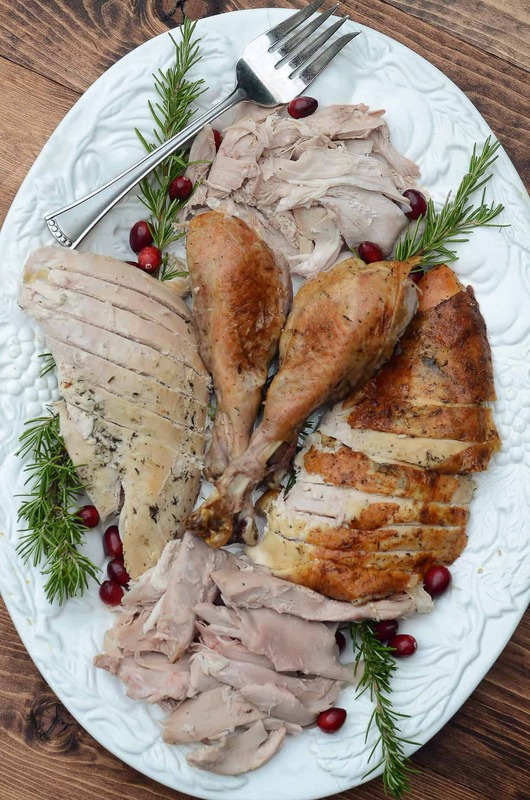 Plain old turkey on a platter isn’t so pretty so it’s nice to add some festive items to add contrast and color. I went with fresh sprigs of rosemary and some fresh cranberries. I have a rosemary plant in the backyard and had an open bag of fresh cranberries in my fridge so this worked for me. Use what you have to pretty it up. Oranges, lemons, and other fresh herbs are also great choices. I hope your holiday is filled with everything that makes it such a special time. Friends, family, and of course, amazing food. Preheat oven to 325 degrees. 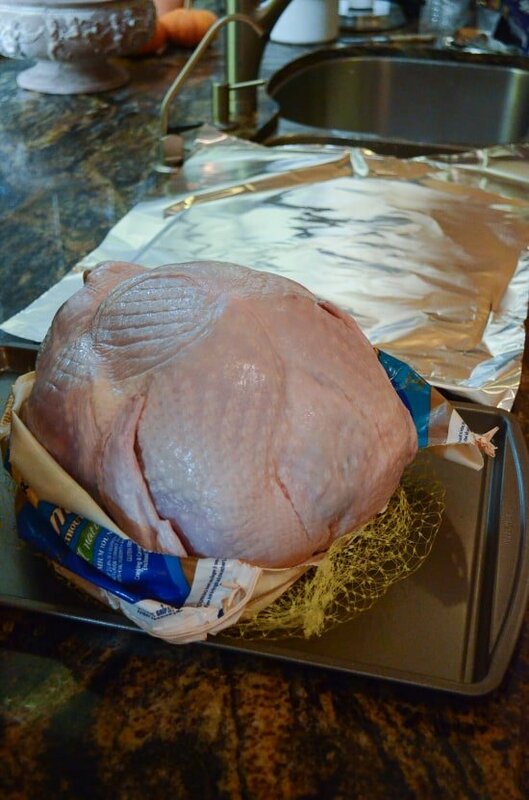 Remove the turkey from it's packaging and place it on a foil lined baking sheet or cutting board. 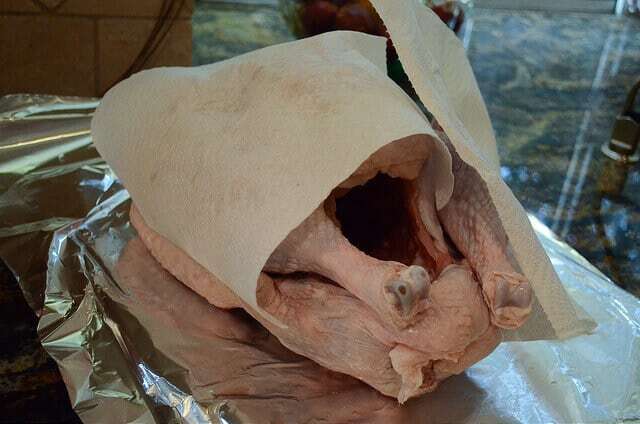 Remove and discard the organs from both turkey cavities. Pat the turkey dry with paper towels. 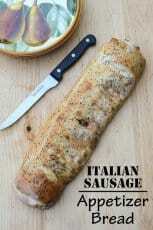 In a small bowl, combine softened butter, olive oil, garlic powder, sage, thyme, salt, and black pepper. 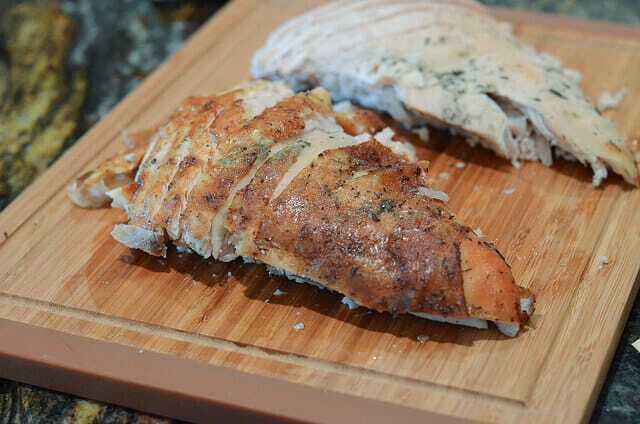 Carefully lift skin on breasts of turkey and push your hand in, lifting skin from breast. Scoop up some of the butter mixture with your hand and spread it under the skin of both turkey breasts. Spread most of the remaining butter mixture over the outside of the turkey; reserve a little for later. 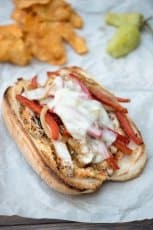 Stuff onion and carrot into turkey cavity. Transfer the turkey to a rack in a large roasting pan. Spread the remainder of the butter mixture over the turkey in places that might have been missed. Tuck wings securely under the body. Pour about 2 cups of the chicken broth into the bottom of the roasting pan. Transfer the roasting pan to the preheated 325 degree oven. 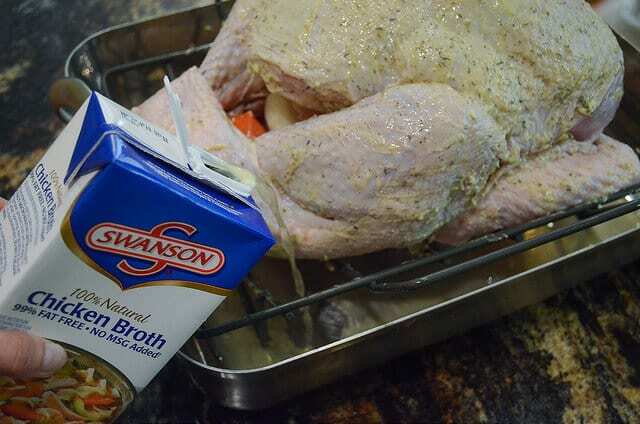 Allow the turkey to roast for an hour and then baste it once every 30 minutes or so throughout the remainder of the baking time, adding additional chicken broth if needed. After two hours, rotate the pan in the oven to ensure even browning. Tent with foil once skin is browned to your liking. Roast until the internal temperature of the meatiest portion of the thigh registers a solid 165 degrees. The roasting time should range from 3 to 4-1/2 hours if your turkey is between 12 to 18 pounds. 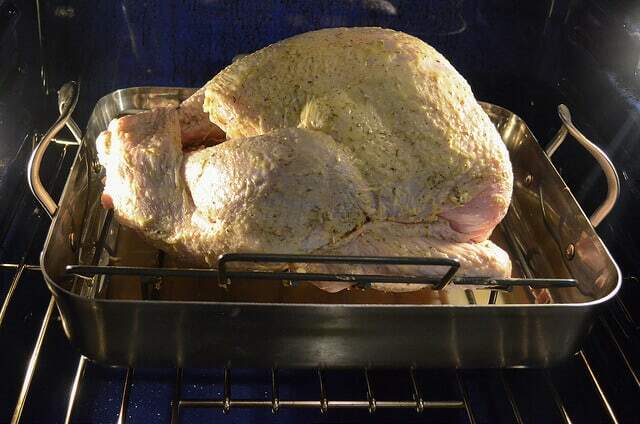 Remove bird from oven, tent it loosely with foil, and allow to rest for about 30 minutes before carving. He’s a Pretty Bird! 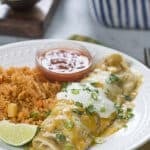 🙂 Sounds and Looks DELISH! 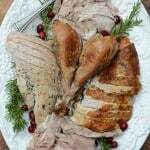 We think that roasting a turkey is a basic skill but unless it is something you have perfected over the years there are tricks and skills to be learned to have a moist and tender result. 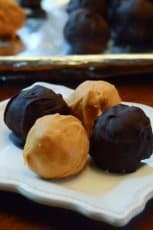 Thanks for all the tips to perfecting this holiday dish. The inexperienced cook in all of us appreciates it. This turkey looks amazing and I’d love to give it a try for thanksgiving this year. 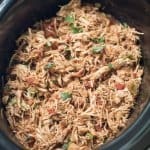 But I was wondering since we like to stuff out turkey with stuffing would that interfere at all with the juiciness of the turkey for this recipe? No, not at all Kathleen. 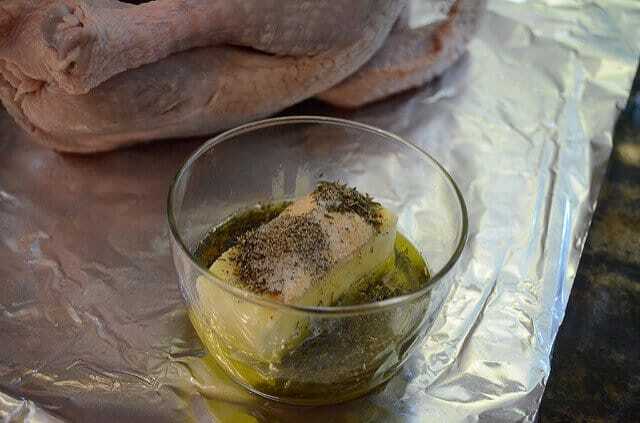 The butter/seasoning rub would just help to enhance the flavor of the stuffing even more. Just be sure to follow all the safety precautions by packing the stuffing loosely in the turkey cavity and roasting to the correct temperature. Can I come to your house for Thanksgiving? What a perfectly roasted turkey! Can the Turkey be prepped the night before? Sure. 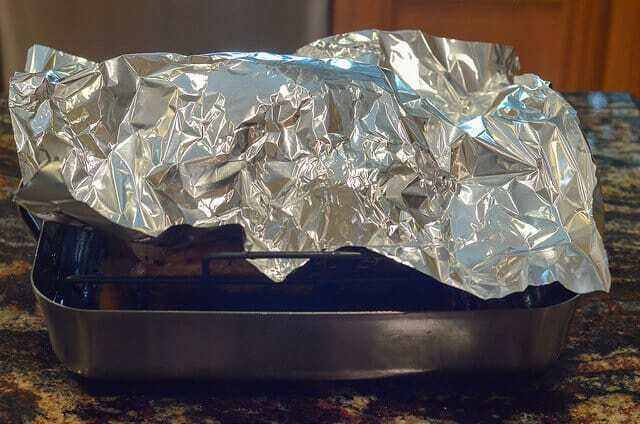 Just be sure to wrap the roasting pan well with foil and keep it refrigerated until the next day. 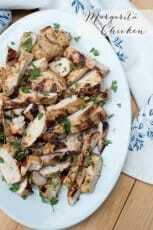 As it is approaching the holidays, I have been looking for a great way to prepare my turkey. I am so thankful I came across your post. I have always cooked my turkeys to much which makes them dry and tuff. I will be going by your step by step instructions this Thanksgiving. I hope my turkey looks as good as yours. Thank you so much for sharing this.